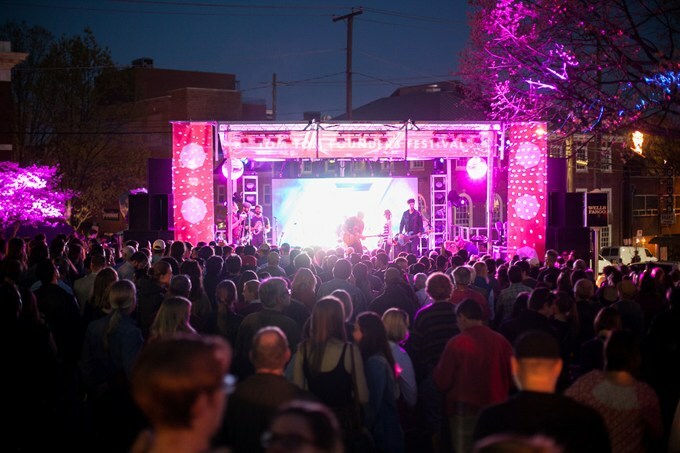 On April 8-14, the Tom Tom Founders Festival takes over downtown Charlottesville with more than 60 bands, 300 speakers and 400 community organizations in outdoor spaces, theaters, galleries, concert halls and more. On April 11-14, the Down by Downtown Music Festival features four days of music, with shows at venues throughout downtown Roanoke. More than 25 acts will take stages throughout the week and at Saturday’s finish festival at Elmwood Park, which will include performances by SPAFFORD, Tank & The Bangas, and Rubblebucket. Throughout April and running through June, the Virginia Arts Festival will be bringing hundreds of world-class performing arts in venues throughout Hampton Roads. Major performances in April include Kristin Chenoweth (April 12), Olga Kern (April 16), and the Virginia International Tattoo, the largest spectacle of music honoring military from around the world. The first ever Something in the Water Festival takes places at the Virginia Beach oceanfront April 26-28 with performances from Pharrell Williams, Dave Matthews Band, Jaden Smith, DRAM, Ferg, Deepak Chopra, Janelle Monae, Maggie Rogers, Missy Elliott, Diddy, Gwen Stefani, Janelle Monáe, Migos, Pusha T, Snoop Dogg, and more. The National in Richmond will be bringing a number of big name artists throughout the month. The venue will be hosting Buckethead (April 5), The Infamous Stringdusters (April 6), Papadosio (April 14), Lord Huron (April 16), Mitski (April 18), Phosphorescent (April 19), Elle King (April 20), and others. The Broadberry will be hosting Of Montreal (April 10), Rubblebucket (April 12), Cris Jacobs (April 19), the RVA All Day Block Party featuring No BS Brass Band (April 27), and more. The Modlin Center at the University of Richmond will host a performance by legendary saxophonist Maceo Parker on April 27. The Ashland Theatre will bring in Natalie Prass on April 20. The Beacon Theatre in Hopewell will host Average White Band on April 10, Colt Ford on April 11, Ricky Skaggs & Kentucky Thunder on April 13, and more. In Charlottesville, the John Paul Jones Arena will have performances from Lil Yachty and Aminé (April 4) and Alabama (April 6). The Sprint Pavilion on Charlottesville’s Downtown Mall will be hosting Leon Bridges on April 10 and the Rockn’ to Lockn’ Finals on April 20. The Jefferson Theater will hosts artists like Patty Griffin (April 2), Phosphorescent (April 17), Parachute (April 30), and more. The NorVa in Norfolk will be bringing in Buckethead (April 4), Lord Huron (April 17), Elle King (April 18), SOJA (April 20), and many others. The Constant Center at Old Dominion University will have performances from Young Dolph (April 5) and Soulja Boy (April 28). Zac Brown Band will perform at the Veterans United Home Loans Amphitheater at Virginia Beach on April 12. Kelsea Ballerini and Brett Young will be performing at the Salem Civic Center on April 17. The Berglund Center in Roanoke will host Travis Tritt on April 14 and NEEDTOBREATHE on April 30. The Harvester Performance Center in Rocky Mount will host many acts including Ana Popovic (April 20), Rick Springfield (April 26), Tyler Childers (April 27), and more. At Wolf Trap National Park for Performing Arts in Vienna, shows will include Robyn Hitchcock (April 11), Storm Large (April 12), Stephen Kellogg (April 18), and more. The Tally Ho Theatre in Leesburg will be hosting Phil Vassar on April 11 and The Mantras on April 25, among many other shows. Alexandria music hall The Birchmere will host Marty Stuart and His Fabulous Superlatives (April 4), Don McLean (April 5), The Bodeans (April 6), Average White Band (April 12-13), Kris Kristofferson & The Strangers (April 25-26), and many more. The post Big Concerts Coming to Virginia in April 2019 appeared first on Virginia’s Travel Blog.